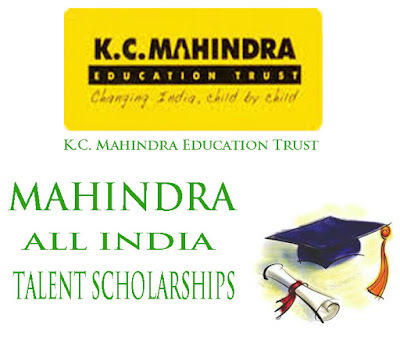 KC Mahindra Scholarships for Polytechnic Students in India Mahindra All India Talent Scholarships for Polytechnic Students KC Mahindra Talent Scholarships for Polytechnic Students Application Form Download This scholarship has been set up to specifically empower students from the disadvantaged sections of our society. It is given to students belonging to lower income group families who wish to pursue a job oriented diploma course at a recognized Government Polytechnic. In 2005, the Mahindra Group decided to double the number of scholarships given to 550 every year. From the academic year 2012-13, each individual through this scholarship gets awarded Rs. 10,000 per annum for a maximum period of three years. The K. C. Mahindra Chair for Nuclear Chemistry at the Institute of Science in Mumbai and the Dhandevi Mahindra Scholarship Award at Sophia College, Mumbai. The Kema Grants established in 1997 provides financial grants and scholarships to faculty members and staff of educational institutions. To be eligible for this scholarship, the students should have passed 10th / 12th Standard or equivalent examinations and have secured admission in a government or any other recognized Polytechnic Institute for Diploma Courses in India. Majority of the awardees are girl students, as the Trust is keen in supporting girls and encouraging them to be qualified and subsequently reduce their vulnerability to exploitation and improve their standard of living.